Glenn Spencer’s American Border Patrol is waging a high-tech campaign to secure the U.S.-Mexico border and stop illegal immigrants from crossing into Arizona. Right-wing defenders of America’s southern border aren’t giving an inch. And their high-tech gadgets are part of almost everyone’s solution. HEREFORD, Ariz. – Glenn Spencer wakes every day in pitch dark, at 3 a.m., a habit he picked up in the last couple of years. “I do my best thinking in the morning,” he explains. The early morning is also when he usually gets an audio tape intercepting chatter between U.S. border patrol agents, which he edits for public consumption. He always uses this information to plot a map of border crossings. Spencer’s group, American Border Patrol, will release all of this online. I wake up at 4 a.m. in the “Coronado house” that Spencer opens for visitors to his 104-acre property on the U.S.-Mexico border. The property abuts a border fence that sinks 6 feet into the ground and shoots up 18 feet above it. I got there at sundown the day before, which meant turning off Arizona State Route 92, past a wary border patrol agent, and driving five miles of dirt roads past dozens of ranches. * All of them sport sturdy fences around the dirt and brush. Many of them are for sale. Years ago Spencer bought this compound from one of those sellers, a retired colonel who couldn’t put up with the drug cartel shootouts. Four years after the construction of that fence, there aren’t any shootouts. It’s a “gated community,” a “little Shangri-La,” says Spencer. The rehabbed guesthouse sits in front of a landscaped pond, and Spencer keeps a sound system and laptop outside, piping jazzy covers of pop-rock hits. At night the only light comes from the stars, the Mexican mining town of Cananea, and from a border patrol floodlight so intense you could sit on your porch and read by the glow. But this isn’t what wakes me up. Spencer owns seven German Shepherds, and some of them have started howling for attention. At 7 a.m. sharp, Spencer drives from his place to the guesthouse on an ATV. Seventy-five years old, with the cheerful look and vocal rasp of Santa Claus in some Rankin/Bass animation, he speculates that the dogs staying with him were disagreeing with the dog staying with me. The dog that spent the night in my quarters is covered in black-and-white spots and named Migra—as in la migra, immigration police. “She doesn’t get along with the others,” says Spencer. So he talks to the press—and, he says, to defense contractors. Spencer initially invited me to the border to watch a trial run of a new gyroscopic surveillance drone designed by his team. The nucleus of the Spencer operation is actually Border Technology, Inc., headquartered a short walk from the guesthouse (just past a horse stable), and made famous in 2003 and 2004 when it started running homemade Border Hawk planes on the American side of the U.S.-Mexico fence. Two years ago, Spencer buried seismic sensors, the kind that he used to find oil deposits in his private sector days, to test whether they could trace border movements. What Spencer thinks is happening is that waves of illegal immigrants from Mexico have weakened America, and could weaken it further. This is specifically why he bothers the Southern Poverty Law Center. In the 1990s, while living in his native California, Spencer worked to pass Proposition 187 (which denied state benefits to the undocumented), and recoiled in horror when it was stymied by politicians and the courts. He started warning of a “Mexican takeover of the southwestern United States,” and in 2001 he delivered a homemade video about this, Immigration: Threatening the Bonds of Our Union, to every member of Congress. * DVDs of Spencer’s videos about “Aztlan” sit around Border Technology’s workrooms, right next to the CubeX 3-D printer the company just bought, to make plastic components for the new drones. 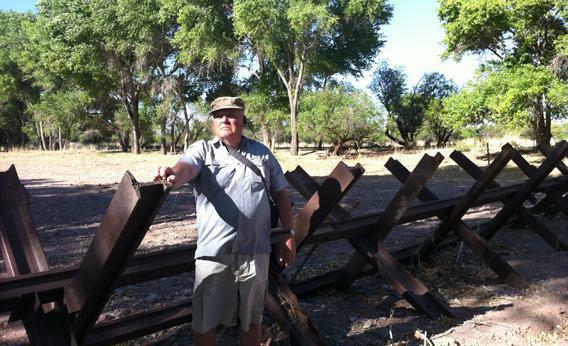 Glenn Spencer stands near a five foot “Normandy-style” fence near his property, on the U.S.-Mexico border. This is rhetorical: Plenty of people have thought about that. That’s why the grand project of closing down the border with technology is such a risk. The senators currently trying to legalize millions of immigrants are in on the plan—not Spencer’s plan, exactly, but an impressive-sounding matrix that borrows from what we’ve learned in foreign wars. If they get their way, we’ll have a secure border and a growing immigrant population. So Spencer and his team keep the discussion to two main topics: The reality of the border and the technology that could close it. The American Border Patrol’s compound is a short walk from the border itself, separated by rough red desert, bushes, and tufts of brown grass. They estimate that the Identiseis project, the burying-sensors-in-the-ground plan, would cost $100,000 per mile. Sensors could be buried up to 6-feet deep, run on solar power—a massive green jobs initiative that tracks the footsteps of people trying to walk from Mexico into Texas or Arizona. The total price tag—maybe $200,000,000 to secure the entire border—sounds ludicrous, and apart from the defense contractor that Spencer can’t name (“one of the big five”), no one could verify it, but it’s roughly 5 percent of the cost of the border fence, and less than Boeing was going to ask for its own scheme—known as the Secure Border Initiative—had it actually worked before a disappointed Department of Homeland Security scrapped it in 2011. Standing on the porch as Migra trots around the yard, I get the full spiel from Mike White, Spencer’s business partner and designer for 10 years, an athletic guy sporting a soul patch and wearing a polo shirt from his side job as a paramedic. “They can find life on Mars, but they can’t find life on our border,” says Spencer. We drive on and park at the fence. 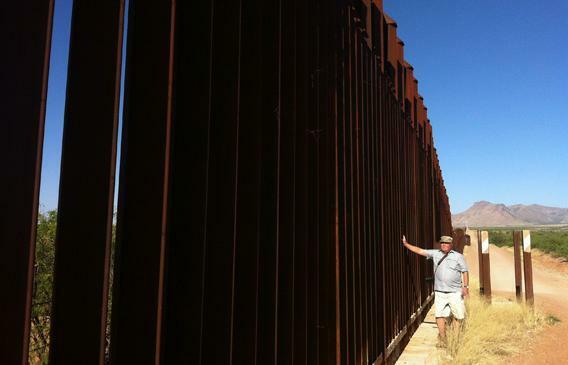 Spencer happily takes credit for it: He started filming the action on the border in 2003, and by 2009, presto, contractors were putting up the rust-colored barrier. “You can still see the flags we put on the old barbed wire fence,” says Spencer. The new fence curves west to a low mountain range where Spencer and other watchers used to spot migrants, clambering up old mining paths on ATVs. Going east the fence tapers off, replaced by a “Normandy fence.” It’s a run of X-shaped metal girders, about five feet high, hard but not that hard to clamber over. Grazing cows meander on the other side of the barrier. More of them stroll along the shallow river where the fence stops. A border patrol agent keeps his eye on the river. He waves at us as we take some photos. When we’re done, Spencer and White set up the dry run of the seismic test. The drone test won’t happen, because they flew it yesterday, and after a few minutes the helicopter banked too hard and plummeted to the ground. The designers speculate that a flawed battery placement brought it down, something that can be easily fixed once they get more material for the 3-D printer. So we wait for the seismic test, as a stiff wind whips the high desert. 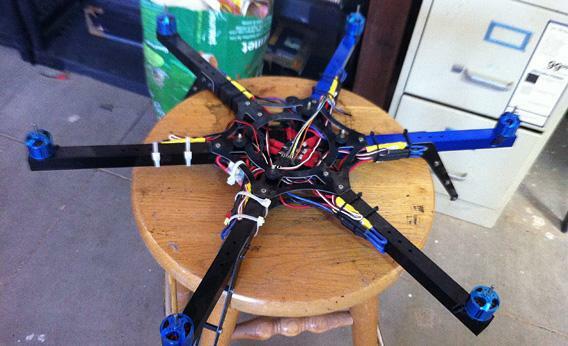 “Normally the sensor would work within 600 feet,” says Spencer, “but this might cut to 400. If it’s raining, you’d see it get cut to 300.” Three of Spencer’s some-time employees, including the guy who landscaped the lovely guesthouse pond, stroll out to the border fence past markers denoting every 200 feet. They wait for the signal. It’s time to check out of the guesthouse. I add my name to a rundown of foreign journalists, state senators, and Tea Party activists who’d stayed in the house since the renovation, and I drive to the suburbs of Tucson two hours up the road. Sen. John McCain is holding the second of two town halls in mostly-hostile territory. One high schooler asks him why we should let border-crossers become citizens “when one in five has a criminal record.” (McCain points out that this isn’t true.) But he disarms the critics. McCain keeps coming back to that point. Mike Wilson, an activist with the Tohono O’odham nation near Tucson, listens politely. He’s “wearing his tribal hat” today, he tells me, but he works with the Border Action Network, one of several groups that tries to assist immigrants crossing from Mexico by leaving supplies for them in the desert. He is about as far away from Glenn Spencer’s worldview as anyone can get. He supports what McCain’s doing—“we need to get the immigration train out of the station.” And although he’s not convinced that the militarization of the border is the answer, his nation is convinced. “They live in fear of drugs coming across,” says Wilson. “I have to acknowledge that. I have to honor those fears. When I go down there and try to talk to human rights violations, they tell me: You don’t live here. You live comfortably. You don’t have to worry about your kid getting off at a bus stop in the desert and walking half a mile as drug cartels are moving past them.” They don’t have any problem with border drones or militarization? “They want it,” says Wilson. Spencer wants it, too. He wouldn’t mind if his technology becomes the backbone for the barrier, and he scores a contract. (“You want to know how to make a small fortune on the border?” he says. “Start with a large fortune.”) But he’s most interested in getting illegal border crossings below 20,000 per year, down from the high six figures that try crossing now. There are supporters of pure open borders, sure, but in politics there’s no real disagreement anymore about locking down the border with whatever technology it takes. Either the restrictionists win, and the solution stops there, or the legalizers win, and the immigrants who’ve made it to Spencer’s side of the border get to stay there. *Correction, May 6, 2013: This article misstated the name of the Arizona highway David Weigel turned off to get to Glenn Spencer’s property on the U.S.-Mexico border. It is Arizona Route 92. It also misstated the name of the homemade video Spencer delivered to members of Congress. It is called Immigration: Threatening the Bonds of Our Union, not Bonds of Our Nation.